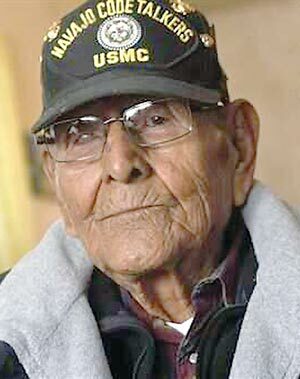 Code Talker Tom Jones, Jr.
Flags on the Navajo Nation will be flown at half-mast this week as tribal members mourn the death of the second Navajo Code Talker in a month. Tom Jones Jr., 89, who lived in Hogback, died in the San Juan Regional Medical Center in Farmington on Monday after a battle with pneumonia and other medical conditions. His service in the U.S. Marine Corps began on Nov. 16, 1943 and he was honorably discharged on Dec. 30, 1945. Jones was a messenger for U.S. Marine Corps 3rd Division, Unit 297 Navajo Code Talkers 767 and Navajo Code Talkers 642 Platoons at Camp Pendleton. "Our father was a private, humble, simple, caring and giving father, grandfather, brother, friend and comrade," said daughter Carmelita Nelson. "His heart was caring, his mind was strict, his life was blessed and his soul was graceful." Jones was profiled in March in a article in the Los Angeles Times which discussed the plight of Navajo veterans who, several decades after they served their country, are living in homes that are almost uninhabitable. "These days the 89-year-old Jones struggles to keep warm during winter because the only heat inside his house emanates from an antique wood stove in the living room. The electricity doesn't work in his bathroom and the floor has worn away, exposing plywood beneath his feet," the article stated. The house Jones lived in was given to him some 40 years ago by the tribe but, like many other houses given to Code Talkers and veterans of the various wars over the past 70 years, no efforts were made to help the veterans and their families keep it maintained. Jones, like many of the 35 or so Code Talkers who are still alive, used a wheelchair to get around but he wasn't able to use it much in his home because the hallway in the home was too narrow for his wheelchair. As a result, said the article, he was forced to spend most of his time in his living room and when he needs to go to the bedroom or bathroom, he had to be carried there. He told the Times reporter that his desire was a house where he could be able to get around, had a heating system that allowed him to "sleep at night and enjoy life." His plight was so bad that Etta Arviso, a woman who was lobbying to get better homes for Navajo veterans, posted a sign in front of it saying "Navajo code talker needs a home." Funeral services will take place on Saturday at the Diné Christian Center in Shiprock, N.M., beginning at 10 a.m. An account with Wells Fargo Bank has been established for donations under account number 2221454164. Jones leaves behind three children, eight grandchildren and seven great-grandchildren.